The main problem with live streaming is to make robust delivery for a big amount of simultaneous connections for a short period of time. This is why RCM used Nimble Streamer to make a set of more than 100 edge servers for handling peak loads during most popular games. There were several protocols used for end-users delivery. They were RTMP, RTSP and HLS. 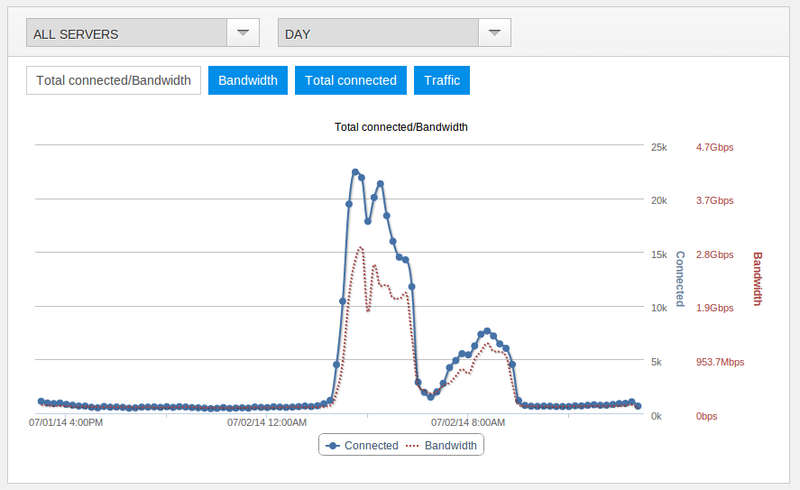 The majority of traffic was served via HLS with Nimble Streamer as a key element. The video itself was published via RTMP from encoding origin to Nimble edges. Each edge was converting (i.e. transmuxing) RTMP to adaptive bitrate HLS stream. When a user was requesting a stream, it was ready for transmission without delay. Another method of HLS delivery from origin to a viewer was a re-streaming of pre-packetized HLS stream. A Nimble Streamer edge server was receiving users’ requests and was requesting stream from existing HLS origin. A smart balancing for incoming connections allowed to split users’ requests to active edges to make the streaming process more robust and reliable. This structure allowed handling thousands of connections. Like, for the final game there were around 70000 simultaneous connections, having 500000 overall connections for the day of the even. This consumed about 15 TB of data with 21Gbps peak bandwidth and more than 100000 hours of total view time. This was processed with 15 Nimble edge servers having the rest of the server farm to be a activated once the load increased and fallback if any live server goes down. Daily statistics for the entire month of competitions. RCM real-time recording module allowed effectively recording video for pre-production and ready instantly right after the event end. This allow the video editor to perform the video editing at extremely fast and the end-to-end workflow managed to publish the on-demand video such as highlight and full-match replay within 3 hours after the games were over. Video on demand was delivered using same balancing principles - users’ requests were spread to Nimble servers which had the content. Each server was able to deliver video via HLS and SmoothStreaming. 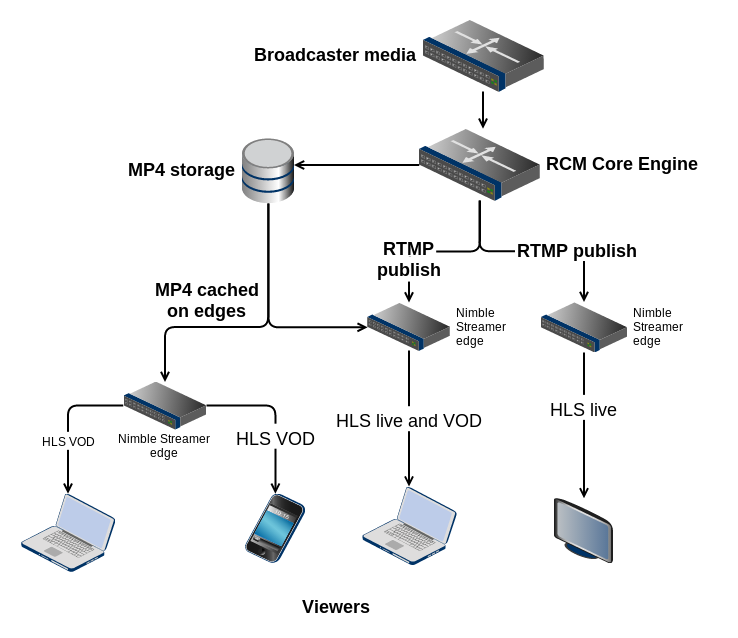 HLS VOD delivery was handled by transmuxing MP4 files on-the-fly into HLS in VOD mode by Nimble Streamer. So people who used HLS-capable devices for live streaming were watching files the same way as they did for watching games real-time. Daily stats for one of VOD media libraries. One of the main security conditions for streaming the largest sports event was a geo-location of viewers. It had to be limited to territory right due to licensing limitation. WMSAuth paywall technology by WMSPanel team was applied to secure the streaming process. Nimble Streamer edge servers were set up to restrict access to the allowed country only. WMSAuth geo-location restriction rules were easily defined in WMSPanel and propagated to more than 100 servers within a few clicks. The games were available on selected partners’ websites. So RCM Solution network had to be secured from anyone who wanted to hi-jack live streams’ direct links for further unauthorized transmission. WMSAuth hotlinking protection was applied for all Nimble streaming edges for that purpose. All links has unique signatures making them impossible to pass-over to third-parties. With entire country watching the event, it's crucial to have major streaming metrics to understand the infrastructure load and to learn more about the viewers of the content. WMSPanel provides excellent reporting for media streaming. Nimble Streamer has native support for WMSPanel stats exchange, that allowed streaming partners to have major metrics for all the content they have. Real-time chart shows current streaming status with connections count, bandwidth and top-20 countries of visitors (here is was obviously just 1 country). Retrospective daily, weekly and monthly high-detail charts. 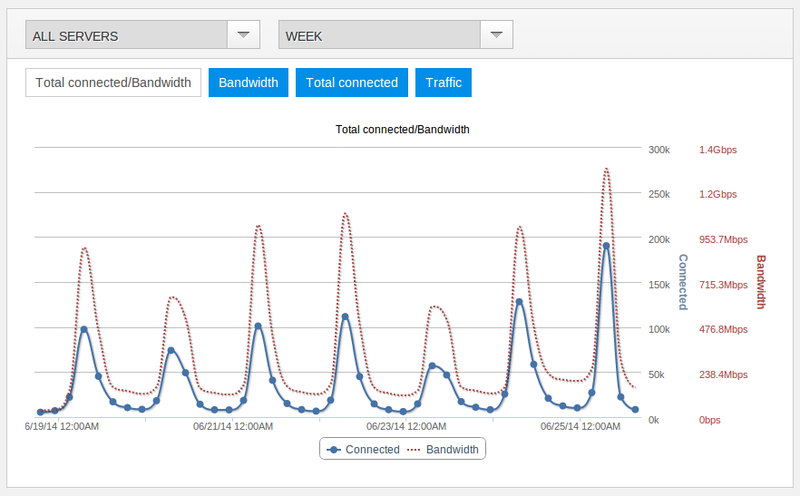 Daily statistics for connections count, traffic, peak bandwidth, timing metrics, devices and players report along with ISP networks of visitors. 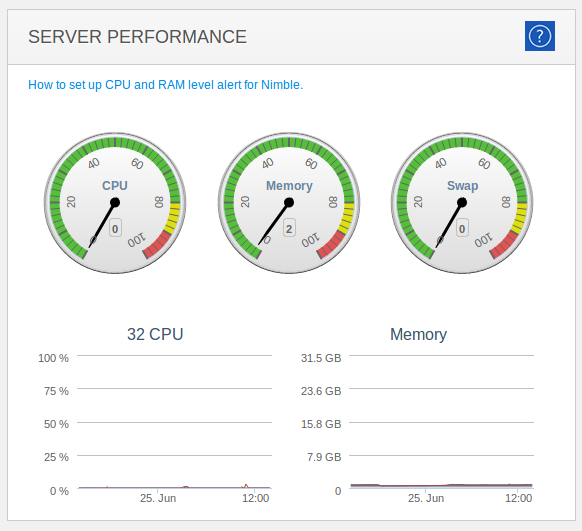 Server performance metrics and charts. All these and other reporting features were available via white label for designated end users. Here are some charts which were allowed for publication. Nimble Streamer is very light-weight. Two nearby games as appear on single day retro high-detail chart. Successful integration of Nimble Streamer and WMSPanel into RCM Solution integral streaming infrastructure allowed delivering live and on-demand video content of the world main football event with highest level of availability and user experience. These technologies can be used for media streaming for any type of events with the best quality level and low cost of ownership. If you'd like to test the mentioned solutions for your needs, check Nimble Streamer website and contact us in case of any questions. RockSoft Cloud Media Solution (RCM) by Cloud CDN Sdn. Bhd. (www.rocksoft.com.my) is a result of more than 5 years of continuous R&D and improvements to the automation in deploying and selling cloud infrastructure and content delivery network (CDN) in couple of days. The R&D revolves around few assumptions such as hardware capabilities continue to improve exponentially with prices going south, bandwidth price is on a downward trend, more hosted services built and run on virtualization technology as hardware capabilities continue to improve and the next Internet traffic growth will mainly generated from consumer websites. RCM built automation that fully automated cloud and CDN platform that service provider can plug and play with minimal intervention, the solution must be efficient to run on a virtualized system and newly adopted Ethernet Fabric technology, provides a seamless way for Content Publisher to migrate content to a CDN and provides a platform for service provider to share infrastructure optionally to reduce operation overhead cost.